"Get It Right, before Bedtime", "When Anger Is Sinful", "Uncontrolled Anger", "When Humor Helped Keep His Shirt On", "Yielding Personal 'Rights'", "Unhappy andLast Place"
"The First and Last Time He Comes", "Was Jesus Born on December 25? ", "An Opportune Time", "Jesus Came Anyway"
"The First Thanksgivng Proclamation", "1789 Thanksgiving Proclamation", "2008 Thanksgiving Proclamation", "2009 Thanksgiving Proclamation"
"Beware of the Drowning Man! ", "Slander", "The Spreader", "Three Things to Remember"
"What God Says about Government", "Should A Christian Pay His Taxes? ", "The Nation's Strength"
"A Dirty Three-lettered Word", "A Partial List of Sin", "Too Late"
"When the Holy Spirit Whispers to Your Heart", "What We Do Have", "Paul's Good Advice", "'Insiders Can Do More Damage"
"The Ten Commandments", "By Faith", "The Priesthood"
"Down and Under", "A Desert Baptism", "A Symbol", "Jesus' Baptism"
"Destruction of the Bible", "In One Ear and Out into the Fire", "Authenticity of the Bible", "Forgotten Treasure"
"... They Shall Know That I Am the Lord. ", "The Hand of God Was Against Them", "Retaliation? ", "How Many Do You Count Me?" "Looking Forward to Heaven", "A Christian's Philosphy of Heaven", "Thoughts of Death", "How Does the Bible Tell One to be Saved from Hell? ", "Heaven's Roll Call", "Going to Bed"
"The Situation Was Impossible, BUT ...", "Reasons Why Prayer May Not be Answered", "They Denied Giving God His Due Credit", "Be Grateful!" "Reasons for Hard Times", "Difficulties One Can Face", "Health Problems", "Different Temptations"
"Work Is God's Way", "Benefit of Work", "The Busy Man"
"The Weapon Against Temptations", "There's a Battle Out There", "Always a Way of Escape", "Making Provision", "Satan Knows"
"Is It My Life? 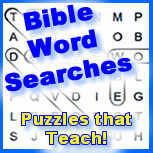 ", "Gifts for Today's Christians", "Obeying God"
"Dad's Influence", "Evil in God's Eyes", "Have a Biblical Example", "What Kind of Example Are You?" "The Rapture", "Before the Tribulation", "Previous Examples of 'Raptures'"
"The Unofficial Meeting of the Order of Doom, Gloom, and Despair", "Can You Trust the Source? 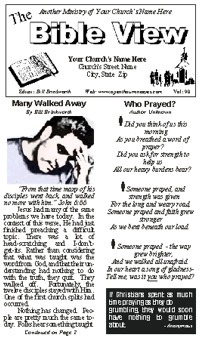 ", "Snail's Teeth", "Dirty Windows"
"How to Know If You Are Saved", "Other Assurances We Can Have", "For We Know", "What Assurance Is", "He Was Sure And Had Peace"
"Real Faith Is Evident", "Faith Training", "Clear Faith", "Have Faith", "Reason's and Faith's Conversations"
More Free Sunday School New Testament Lessons and Sermon Ideas!